Natch spent a few too many camping trips on hard ground so he started looking on craigslist for a tent camper. At spring trout camp this year he showed up with a camper similar to my 61 Chief and I knew I had to do a post. 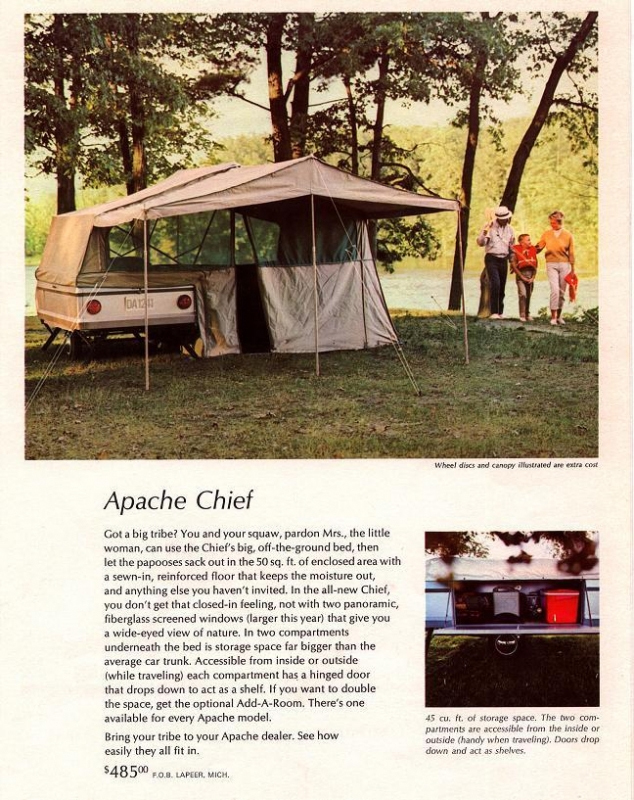 Based on photos and catalogs found online he has a 1966 Apache Chief and it could well be the last single bed Apache Chief ever manufactured. 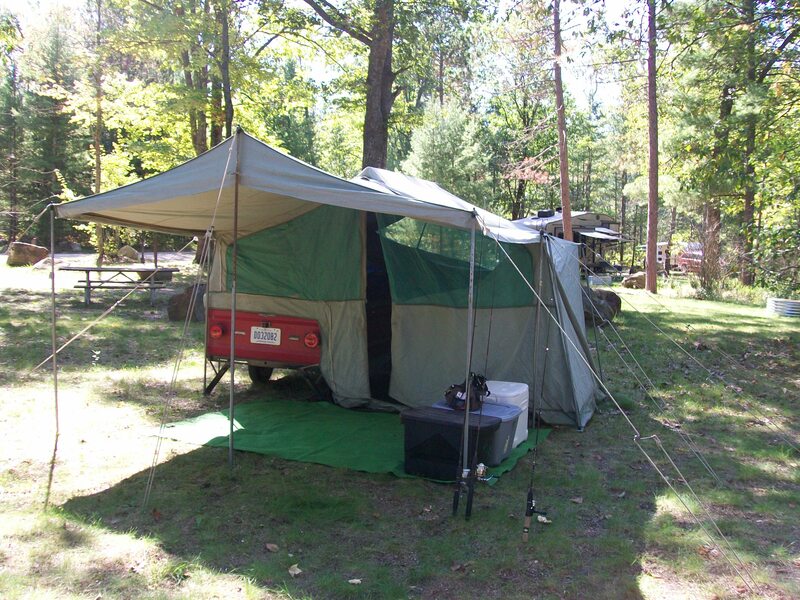 Starting in the early 60’s Vesely Manufacturing started offering the Apache Eagle with double slide out beds, a design which laid the foundation of pop-up campers still in use today. They phased out the single bed Apache after 1966. So Natch and I have the first and last Apache Chief single bed models produced by Vesely Manufacturing. I should also mention that Jake inherited Feral’s 1961 JC Higgens camper based on the 1961 Apache Scout which was manufactured by Vesely for Sears. Last I knew Jake was looking into canvas replacement. 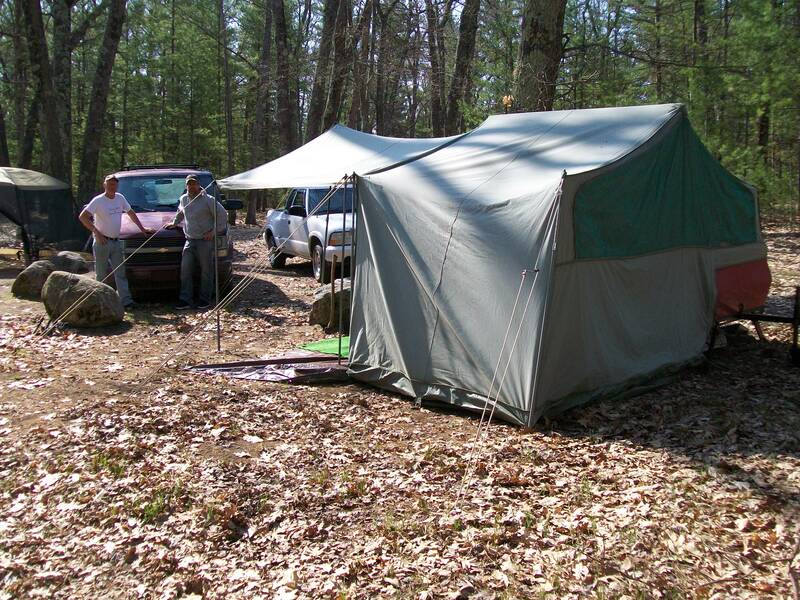 There’s a post buried in the fichigan archives on that camper – try JC Higgens in the search tool if interested. Here’s an ad for the 66 Chief. The ad is definitely 60’s and might explode the “politically correct” meter in multiple directions but you can get a sense of the camper utility. Note that you can click on photos to enlarge, use your browser back button to return to the post.